Rhett Repko named 2018 Songwriter of the Year! "It is with great honor that I am happy to announce Rhett Repko as the recipient of the Warlock Asylum International News 2018 Songwriter of the Year Award! Congratulations! Your musical contributions to human society are deeply appreciated." In your bio, it’s been mentioned that your music do not aim for perfection. Can you please tell us about your musical vision? I just want every song to be real. I want different kinds of songs that will hold specific and unique emotions inside each of them. Every song has a purpose, and that’s to express an emotion and share it with my audience. It’s OK if the mix isn’t quite perfect, or the video isn’t exactly how I imagined it. The only thing that matters is that you feel something when you listen to the song. We have listened to your tracks and our favourite part of the songs are the lyrics. The hard work is quite evident. So, where do you draw the inspiration to work on the songs? Thank you! The lyrics are a very important aspect to me that I can’t fake. Every song stems from a certain emotion I’m feeling in that moment. Those lyrics all hold real pain, real frustration, and real happiness. How was it working with Chris Gehringer on this? Having Chris Gehringer master my song and my upcoming EP “Songs of the Night” was an absolutely dream for me. The fact that he mastered most of my favorite modern records today by bands and artists such as twenty one pilots, The 1975, Harry Styles, and Leon Bridges is just too perfect. I don’t think it can get any better then that. "Thnx For The Ride, strengthens the talented young man’s position as one of the most promising artists on the indie scene today." "He has the chops, musical discernment, and charisma capable of carrying him far beyond the cozy confines of independent music and experience mainstream success on a wide scale." "A songwriting high point arrives with the track “It Ain’t Coming From You”, and Repko fans the caustic flame of heartache burning inside this song with an impassioned singing performance." "Guitarist Stefan Heuer contributes some important harmony vocals throughout Thnx For The Ride, never vying with Repko for supremacy in the mix, but rather strengthening his already fine delivery." "“And I Told Her So” is probably Stefan Heuer’s finest moment as a guitar player on this EP and his lead work late in the song immeasurably adds to its final impact." "“Maybe I’m Weak” embodies the sort of personal, yet accessible and relatable songwriting, that’s brought Repko a great deal of notice and it’s clear he’s refining his style more and more with each new composition and release." 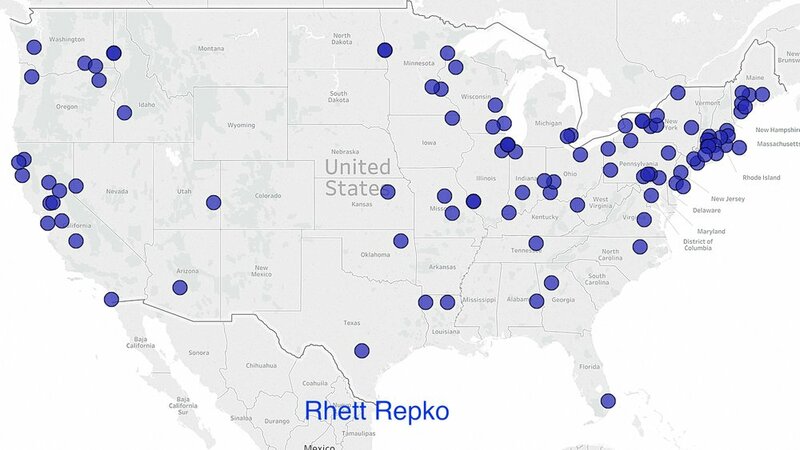 "The exponential growth of a talented young musician and songwriter is a thing to behold and Rhett Repko is progressing like few others today." "Repko makes no bones about being a classicist in some respects, but the most refreshing aspect of his songwriting and performances is how he fuses that approach with a very modern production style and a rambunctious sense of the possible." "Even on a recording, there’s a palpable chemistry these four musicians share and one can only assume they are even more explosive in a live setting." "This vital studio recording opens the door to an ever brighter future for Rhett Repko." "Repko marries winning pop melodies with a rock backing and Repko snaps off its lyrical content without ever sacrificing phrasing in favor of power alone." "Rhett Repko’s upward ascent accelerates with the release of his new EP Thnx For The Ride, a seven song collection of intensely focused rock songs with a sharp commercial edge." "It’s another winner for Rhett Repko and Thnx For The Ride, despite its EP status, has the sound and feel of a major work from this talented musician and songwriter." "I fell in love with the raw energy driving Rhett Repko’s Thnx For The Ride from the first hearing." "It’s an EP release that feels every bit as complete as any full length album and leaps out at you from the first song onward." "Another strong point of this EP is how well Repko meshes a first class vocal presentation with his obvious love for rock, even hard rock." "Rhett Repko proves himself a master of pouring old wine into new bottles, but the seven songs included with this EP proves he’s, likewise, a songwriter and performer with an intense personal stake in his art." "Thnx For The Ride never strains credibility, feels immediate, and crackles with genuine inspiration." "Thnx For The Ride sounds like a condensed, explosive statement of purpose rather than just some run of the mill rock release." “It Ain’t Coming From You” is a great example of his voice’s transformative powers. It’s another great rock track married to a Repko lyric and vocal tinged with just the right balance of bitterness and heartache. "His debut EP ‘’Thanks For The Ride’’ generates the new single ‘’And I Told Her So’’ which seals his place as a gifted singer and songwriter in the musical world." "Repko is a true genius when it comes to songwriting and this song, ‘’And I Told Her So” is the latest example of the same." "He has rejuvenated the music industry with a new and refreshing musical harmony by dramatically amalgamating the music styles of rock and roll and pop music." "This is real music from real musicians playing real instruments derived from real talent." "The artist’s energy has a rock swagger to it, like a young Bob Dylan going electric and shocking the Newport Festival audience for the very first time." "His recent single, “And I Told Her So”, is a particularly great example of Rhett’s unique sonic vision and appeal." "I hope I am not stepping over my boundaries here...but place him on the stage with the Doors, Nirvana, The Greatful Dead, Jimmy, hell even Prince....and the mans ability to rock out and deliver will have him shoulder to shoulder with them as a great musician who creates timeless art." "The brace of songs that I have got to know Rhett through over the last few months has been exactly what I needed to restore my faith in pop music." "In short it struts majestically through a pop-rock landscape, master of all it surveys." "By far the true heart and soul of the piece comes from Rhett Repko’s passionate vocals that tell a story with the utmost care." "Energetic to its very core everything about the song rushes by in a glorious blur, from the urgency of the guitar riffs to the way that the whole piece nicely transforms itself into a fantastic groove." "Fans can expect a highly-polished production that exudes righteous instrumentals, a remarkable guitar performance and flawless rock vocals." "From a songwriting perspective, Rhett’s latest release offers candid lyrical content that is undoubtedly relatable. The energy conveyed through the lyrics is uplifting, carefree and unapologetic." "“And I Told Her So” is the quintessential listening experience for music lovers who appreciate the conventions of rock and the mass appeal of alternative music." "Explosive guitar play, heavy hitting drums, and lots of energy dominate this infectious tune titled, ‘And I told her So’." "‘And I Told Her So’ is groovy enough to attract a universal audience." "It simultaneously feels like a step in a slightly more polished and energizing direction. It’s definitely his strongest release yet, and I was a fan regardless." "You get a real showman presenting the music to you. Anything sounds better when the artist showcasing it is already, clearly in love with the process – it’s a great thing to experience." "Gifted musician and songwriter Rhett Repko is trailblazing a monumental banquet of rock music cuisine." "Repko’s work ethic earns a place of admiration in the hearts of everyone who understands the depth of what quality means." "Rhett Repko Found The Driver’s Seat With His New Song – Thnx For The Ride"
"Thnx For The Ride, Repko latest single, is a perfect example of the boundless potential of his music." "Repko delivers the perfect vocal for the track in a neo-Dylan style manner. Thnx For The Ride is that hazy dream of a musical genius in the translation of life’s love for real situations." "I always knew that there was something a bit special about Rhett Repko." "Repko shows that he is happier conducting music gene splicing experiments and if not creating a whole new musical genre at least show that those generic boundaries never really counted for much in the first place." "Last time out he played with nothing less than pop reinvention, a slick re-presentation and the perfect singer-songwriter make over, Thnx For the Ride (not sure I approve of the willful misspelling though!) however, pushes those genre-hopping ideas a lot further." "Their sound makes me think of the work of bands such as Foo Fighters, Green Day or Weezer." "Who said heavy music couldn’t be catchy? This great song proves that even hard-hitting tunes can be readily appealing to a vast and eclectic audience!" "The sound is big, leaning partly towards the distorted world of indie rock, and partly towards the more electronic, even reggae influenced edge of creative audio." "The creative variation is simply a strong indication that there’s a lot of songwriting and musicality to come. " "Opening with a sweet sounding guitar rhythm, Rhett’s polished and infectious vocals lead us into a potent and impactful synth melody which seamlessly transitions into a poppy, reggae-esque progression that carries us through the verses." "Driven rock guitars and punchy backbeats pull the song in an altogether more groovesome direction yet it still understands how to appeal to the commercial market, knows how to work with dynamics and drips with infectious melody." “So essentially, this is a new take on pop music, yes, pop music, we have spent so long being spoon-fed dance routined, production line dross that we have forgotten that pop, okay, pop-rock can be like this as well." “Pop music is done often, but in general not done well." “All to often it is happy to sacrifice creativity for formula, to wander very narrow, established pathways for fear of losing site of the pop-fan dollar." “Rhett Repko shows us that if you flip this model on its head, draw in influences from a number of genres, you can write songs, which both appeal to the masses and retain the integrity required by the more discerning listener." "Rhett Repko and his posse of groove outlaws have come to rescue pop radio." "One can describe the current state of pop music like an old western movie plot; pop music having been taken over by DJs, programmers and cheesy keyboards is the damsel in distress having been kidnapped by outsider rustlers, needing a sheriff Repko has brought real live instruments and his best men to take the genre back to its roots." "This is pop when blessed with purpose and a destination." "Guitar-toting pop rock maven Rhett Repko saw that the current crop of artists is lacking soul, so armed with a 6-string he presents his debut EP About Last Night." "Several genres mix together here but, at heart, it’s infectious pop with some serious muscle that boasts mellow acoustic rhythm and fiery lead guitar figures sizzling n’ boiling beneath Repko’s Beatles’-tinged vocal melodies. Instead of taking the easy way out by presenting a 6-song EP with only one musical flavor, Rhett is constantly shaking things up." "Nobody on pop radio is playing this which means Repko is filling a monstrous vacancy where guitars and real instruments are a breath of fresh air." "Melody-wise, it’s built for pop radio and each song features more than a few sections that will stick in your head, though the fleet-fingered guitar pyrotechnics give the music an edge that most only dream of possessing." "No two tracks sound alike on his latest EP and there’s a smattering of influences from 60s rock/pop to country to blues to 90’s fuzzy guitar and everything and anything in between." "Not only does he sing and play on all of his tracks, he writes them from the ground up as well. It will be exciting to see where he takes this sound on a full-length outing but for now this EP is a great introduction to an artist that everybody should keep an eye on." "There are no failings to be found here as Repko’s talents all universally register as strengths on the talent-meter." "For anyone that thinks pop songwriters are fresh out of tricks, they will do themselves well to pick up a digital or physical copy of this top-notch release." "Rousing acoustic guitar bits played with a quick tempo and high-energy ride alongside smoldering electric riffs and bluesy leads while drummer Tom Bryant’s maintains a quick pace on the snare and bassist Dan Gallagher settles on a deep low-end churn." "The lead-in composition “Were You Ever Really Mine?” sports a slick, radio-friendly acoustic groove and prominent vocal melodies that showcases Repko’s knack for sultry high-note melodies. Though he could steer the track in one sole direction, acoustic meditation is intersected by Stefan Heuer’s heavier riffs and busy lead guitar licks." "This EP could become a huge crossover success with college radio behind it. Mainstream radio could additionally benefit from adding Rhett Repko’s tunes to their playlist." "The songwriting is airtight, the playing fluid and the production thick enough to make both sides of Repko’s style stand-out." "“Bye Bye Baby,” is a showcase for Repko and his lone acoustic guitar, travelling in the shoes of Dylan, Adams and other before him." "We are going to be hearing some exciting things from Rhett Repko in the future. This EP is a fantastic start and spotlights a singer/songwriter elevating a genre of music that’s long since fallen into a musical wasteland. He’s not afraid to invigorate pop with gutsy rock and bravado, enough to please the rock n’ roll purists that like their pop to walk the more aggressive side of the tracks." "When someone like Rhett Repko comes along playing catchy, hook-driven tunes with prominence placed on the guitars and a real rhythm section, then I stand up and take notice." "Opener “Were You Ever Really Mine?” piles on the folk acoustic guitars with electrified choruses that benefit from Stefan Heurer’s fiery leads; there’s both pop songwriting standards and head-nodding riff rock on display here, all of which is deftly handled by Tom Bryant’s bustling snare shuffles and bassist Dan Gallagher’s buoyant grooves." "A funk/soul swagger shines through on this track which illustrates that pop can be actual music in 2017… given the right touch and musicians." "With pop music essentially compromising bubblegum versions of electro/techno in the 2000s, it’s about time someone takes the genre back in time." "Rhett Repko is one of the few exceptions to the 2017 rule of thumb. Here is a guy that writes catchy, easy on the ears tunes with melody that also happens to play guitar in addition to featuring a lead guitarist in his band. Someone get the smelling salts for I may have faint." “There is some pretty sophisticated songwriting at work here.” “The Beatles, Arctic Monkeys, and Nirvana are influences on this new eponymous EP. The pop appeal of the songwriting and the hard buzzy sound of the guitars certainly reflect those influences, as well as bands like Green Day and Good Charlotte in their flair for the dramatically ambitious and their pleading, piercing vocals." “Influences aside, Repko and company have forged their own sound here. For every move Repko makes in the song, his band is there to back him up perfectly." “He is such a talented songwriter as his music has that timeless classic touch." “It somehow presents this very raw, acoustic, singer-songwriter vibe, and at the same time emits this immense indie rock energy - both of which pulled together, surround you with a brilliant, uplifting warmth”. "Rhett Repko sculpts a flawless sound with the burning tragedy of “Were you Ever Really Mine?" “Rhett Repko delivers “Were you Ever Really Mine?” with a fiery passionate fervor. Nicely tying together, a bluesy song with indie rock style, the song lingers in the mind long after its over”. “Guitar work has gorgeous quality to it, full-bodied with a slight hint of defiance. Rhythms have a swinging quality to them, just flirting with becoming fully unhinged." “Rhett Repko is a songwriter with a truly outstanding approach to his craft." “This is an emotional song of love and loss, in the vein of artists such as Ryan Adams or Elliott Smith." “The song’s beautiful acoustic strumming and country-laden beats are a perfect match to Rhett’s subtle vocals, which are low-key, yet far reaching and truly deep in their emotional tone." “With raw rock-and-roll attitude, some serious grove, catchy melodies and the sweet sweet sounds of a distorted guitar, Were you Ever Really Mine? is everything you love about classic and modern rock music without all the unnecessary over-the-top production tricks”. “Rhett delivers an organic, honest, unforgettable wall of frequencies guaranteed to leave you hooked”. Can you talk to us more about your song “Inside of Me”? Musically speaking, “Inside of Me” is very retro inspired in terms of writing and production. It has an upbeat, almost happy and innocent sound to it. The lyrics on the other hand are an emotional journey that deal with letting someone close to you know that you don’t see them the same way as they see you. Sometimes it can be slow and painful before you come to the realization that you just have to tell the person even if it hurts them. As the last line in the song says: “Cry baby, cry with me, cry and cry until you’re free”.